As a result of a series of efforts to attract foreign investment, Cambodia has set up a number of foreign factories that hire local labor. In several major markets in Phnom Penh, you can easily find branded jeans and backpacks which were seemingly stolen by the factory workers and being sold at a very cheap price. The grocery store is filled with Vietnamese and Chinese decorated daily items. These are made in Combodia, these objects with unknown origins in the market always attract my interest because of the ambiguous introduction of vendors. 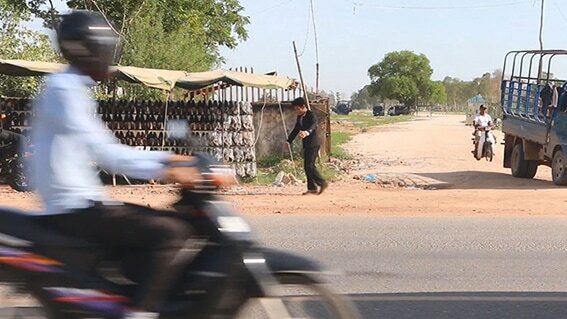 This entire scene is concentrated in the area nearby Phnom Penh International Airport on the 4th road. The National Road No.4 is 230 kms long, starting from Phnom Penh, and has direct access to the largest local port, Sihanoukou port. On both sides of the road are different types of foreign factories. The most amazing scene occurs at 12 noon during lunch break and 5 in the evening when the workers get off from their work. 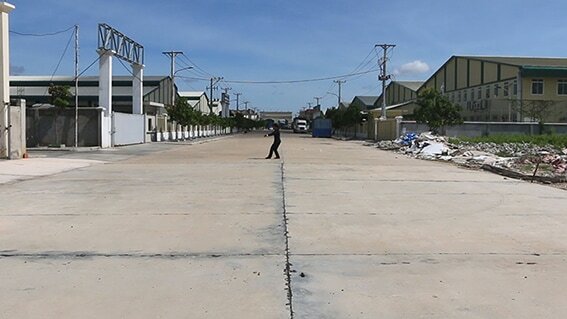 Before 12 o’clock, there are already stall carts stationed in front of the factories, vending products like meals, branded clothing taken secretly from the factory by the workers and household goods. As the clock strikes 12, the factory gates open and a huge number of workers throng this temporary market. The market disappears as when the lunch break comes to a close. At 5 in the evening, the sheltered trucks arrive at the factory. The workers climb upon the truck and hold on to the metal bars as if they are commuting in a bus, and the truck leaves the factory. 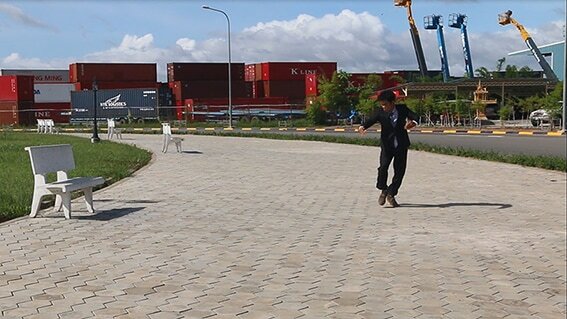 These photographs taken in Cambodia show a local dancer, wearing suits bought from the Phnom Penh market, dancing upon my request, outside the factories on the National Road No.4.